Villa Shinta Dewi Seminyak is such a pretty villa; it brought grins to our faces as soon as we walked in. And we were given such a warm greeting by the staff, with a frangipani garland each, a welcome drink and cool refreshing towel. The villa is built around an inner courtyard dominated by the pool, and although there’s not much garden the plants and flowering trees are gorgeous. The interiors are also lovely, with very comfortable sofas, chairs, beds and sunbeds, and sophisticated soft furnishings. It’s a tasteful, grown up villa, and this is also reflected in the service, which is very discreet. The staff have big smiles and the chef’s forte is a great homemade pizza and a hearty breakfast (breakfast is included in the villa rate; all other provisions are on guest account). 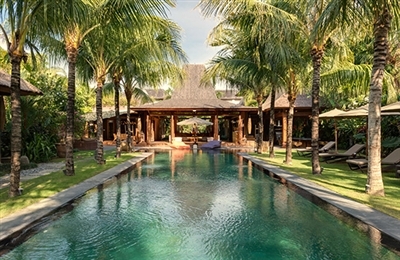 We certainly had no complaints on our return visit to Villa Shinta Dewi Seminyak. 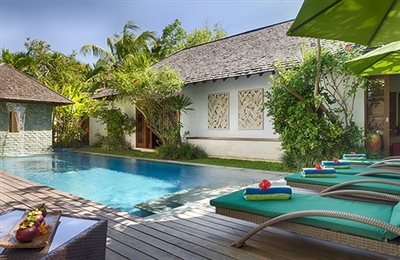 This charming villa has been beautifully maintained and refreshed with new soft furnishings, a new non-slip floor in the gym, wall coverings and generous licks of paint. There are now two 47-inch flat screen TVs, one in the open-air lounge and one in the study, complete with surround-sound, which turns this cosy room into a small home theatre. The villa manager told us that all the guests love this room. 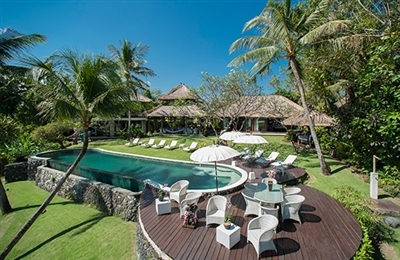 In fact, reviewing the great choice of guest relaxation areas at Villa Shinta Dewi Seminyak, and after having spent a bit of time in the delightful sunset lounge, we decided to up the score a bit. We also increased the score for the staff, they’re a great team. This is a great villa for families or groups of friends, with loads of space, private places to escape and plenty of entertainment for all ages. The pairing of the six bedrooms means that three families can easily escape from each other in their own separate areas. During our visit to the villa the staff surprised us by setting up a sunset table for two on the sand, within a circle of candles and flaming torches, to create a most romantic feast of local dishes. Only after the sun went down did we realise that the ‘circle’ was actually a heart shape! 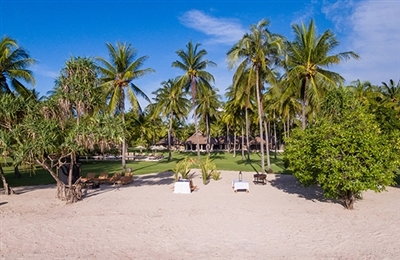 The chef has created a great menu and can turn his hand to anything but loves to indulge his guests with Lombok specialties. Due to the remoteness of the area, you’ll be asked to order your first meal and any special requests in advance of your arrival. The kitchen will operate on a menu or grocery system according to your preferences. Fully self-contained, we didn’t leave the confines of the villa grounds except to swim in the ocean. The electronic beeper that we were given to summon the staff at anytime was a great idea (and necessary due to the size of the place). No one claims that this villa is 100% environmentally sustainable but great care has been taken in the design to be as eco-friendly as possible. We were very aware that, although were indulging in six-star luxury, we were having a low impact – the pool is chemical free, our long showers and baths were solar heated and the water we were using was being recycled to nurture the organic gardens. Chirruping squirrels, meowing peacocks and croaking frogs are just some of the orchestral sounds we heard at Siri Wedamadura. 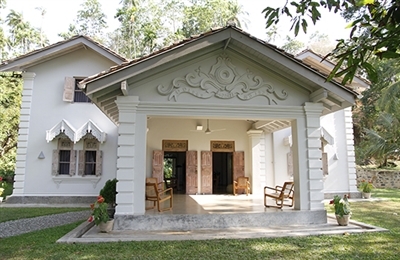 The tropical grounds stretch up a hillside (the house and pool are located on the lowest part of the land) and this expanse makes you feel like you are in the countryside yet the house is centrally located in Mirissa. The beach (where you’ll find lots of simple restaurants) is less than a five-minute walk away, and embarking on whale- and dolphin-watching trips couldn’t be easier as you only have to walk 200 metres or so to reach the harbour. Lined by colourful catamarans the harbour is an attraction in itself, so save some time before or after your whale-watching trip to explore. We felt that Siri Wedamadura would be a perfect escape for families. The grounds are vast, the pool is generous, the beach is close by and the friendly staff are on hand to cook, clean and tidy. Of the four bedrooms, three are twins, but can be pushed together to make kings if required. Aside from the pool and gardens (and a lonely bluetooth iPod dock), there are few facilities here, so if you think you’ll need more entertainment, bring your laptop, DVDs and a stack of books with you. 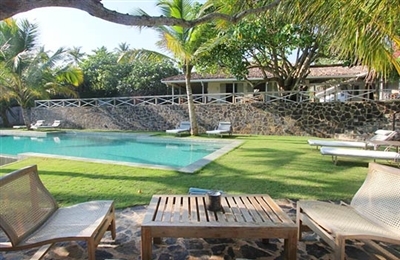 The staff were helpful and the management team (based in Galle Fort) are on call at any time. 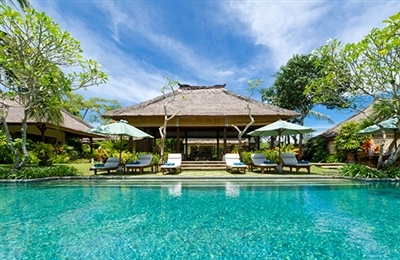 Sungai Tinggi Beach Villa lies right beside Pererenan surf beach, 10 kilometres north of the downtown Seminyak beach scene, so it‘s very private, very secluded and very much all yours. An organic boundary of trees and shrubs, instead of the usual high stone walls, makes a pleasant change, and there is plenty of space, greenery, and wide open vistas of the ocean. Our stay at this villa was blissful. We enjoyed the comfortable informality, not only of the staff but also the layout of the villa and garden. The staff were keen to please; they indulged us with delicious home-cooked goodies, freshly squeezed tropical fruit juices and service that came from their hearts. The swimming pool is free-form and fun but also long (and deep) enough to do as many laps as you deem appropriate. We lazed in the garden balé and hung out poolside until just before sunset, when we headed upstairs to have a couple of beers and a game of pool in the open air lounge. The west coast of Bali is renowned for its magnificent sunsets, and this lounge has to be one of the best places to watch it happen. 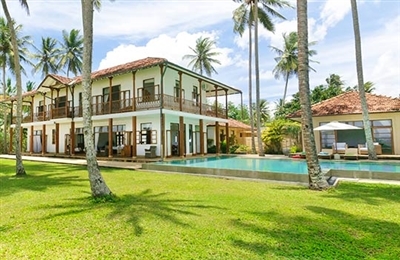 Suriyawatta has immediate appeal: the location of the pool is amazing, the sea views stunning and Duminda’s cooking heightened our appreciation even more. Relaxation comes easy here – evident from the wide lounging ledge in the pool, the comfy loungers, the cushioned daybeds and the shelves bursting with novels (both English and French, spanning all genres and eras, along with an eye-catching number of architecture and design tomes). With three twin bedrooms, kids’ chairs, pool inflatables, garden games, a swing, and babysitters-on-call, this is an excellent villa for families (it sleeps 6 adults and four kids), and the fence between the upper and lower lawn (and the pool) provides peace of mind. Groups of friends will find the Sonos sound system wired to the pool area particularly appealing. The excellent staff team is very professional, finding the right balance between being attentive and discreet. Great food comes out of the kitchen (and there’s a big suggestion menu), the stewards are there before you know what you need and the manager keeps everything shipshape. Distractions are well hidden; the main living room does have a TV and DVD player, but it is inside an antique cabinet. The kitchen is slightly separate from the house yet easily accessible and well equipped.